Well can’t you see that it’s just raining? But there is a need to make some hot pancakes, cover them in maple syrup and proceed to eat them in your over-sized t-shirt while catching up to Comedy news on a Sunday morning! Whether it’s with a loved one, on your own, or in my case, with a brood of siblings and both parents, homemade banana pancakes fresh off the pan is definitely one of my favourite ways to have quality time with myself over the weekends. 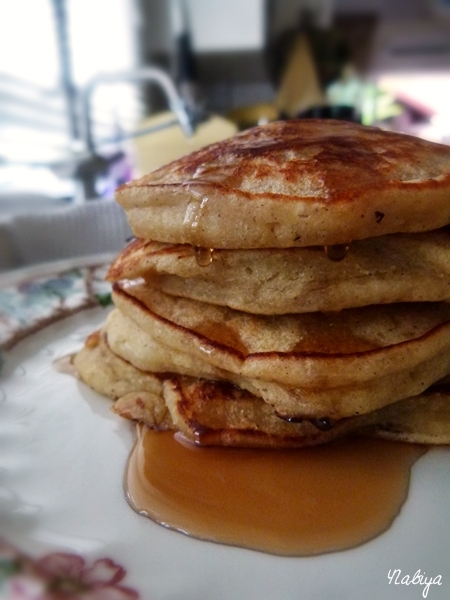 So happy Sunday, friends, hope you make a batch of these delicious pancakes, and don’t do anything too taxing, you know? Just take the day for yourselves, sit around in your PJs until four, then shower and get into a fresh set of PJs. These Banana Pancakes will take you all of 5 minutes to prepare, and then flip at your own pace. Pour the banana mixture into the flour mixture and you can be lazy like me and just beat with the paddle attachment for 3 to 5 minutes, or stir until combined. Let the batter sit for 5 to 10 minutes to ensure fluffiness!